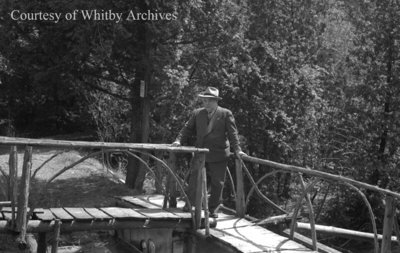 A black and white medium format negative of Mr. Eric Leach, dressed in a suit and wearing a hat, standing outside on a small wooden bridge. In this view he is standing where two bridges meet. He has his hands on the railings of the bridge. Eric Leach, 1944, Marjorie Ruddy. Whitby Archives A2013_040_622.